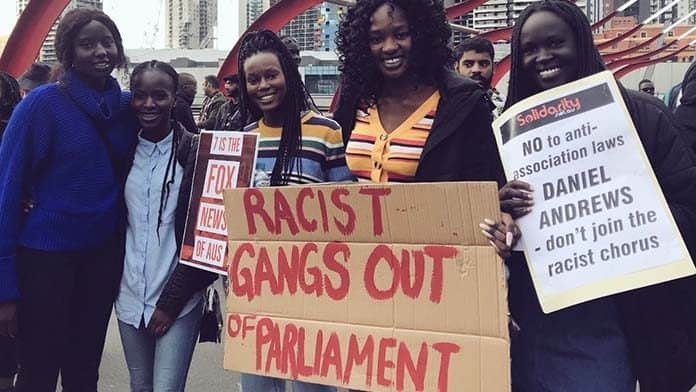 A defiant 500-strong protest led by South Sudanese youth and students stood up to the barrage of government and media racism, rallying on Saturday 28 July, against Channel 7’s airing of the racist “African Gangs” segment on Sunday Night in early July. Channel 7’s segment is a shameless continuation of a relentless racist campaign since late 2017, when Federal Immigration Minister Peter Dutton and Victorian Liberal opposition leader, Matthew Guy, began to push the idea that Victoria was “over-run” by “African gangs”. Although Victoria’s Chief Police Commissioner rejected the suggestion at the time, the media continues to demonise and racially vilify Sudanese youth. As Victorian Crime Statistics Agency figures from September 2017 reveal, those born in Australia were responsible for 71.7 per cent of crime, while Sudanese-born were responsible for just 1 per cent. The Liberals’ campaign against Sudanese and African communities has a longer history. In 2007, Liep Gony was the victim of a brutal racist murder. Yet just three days after Liep’s murder, then Liberal Immigration Minister Kevin Andrews implemented an immediate freeze on accepting African refugees. At the time, Andrews claimed that Sudanese migrants were responsible for violence and instilled the idea of “violent Sudanese gangs”. Victorian opposition leader Matthew Guy has distributed a shockingly racist election leaflet. The leaflet, with an image of black men in hoodies in a park was titled, “Stop Gangs hunting in packs”, likening black men to animals. It was later revealed that the images were taken directly from a 2012 London Evening Standard newspaper article. Malcolm Turnbull’s comments about the existence of “African gangs” has similarly boosted racism. But while the Liberals ramp up their racist offensive, the current State Labor government’s proposal to introduce the new “Unlawful Association” laws is aiding the Liberals’ racism and hysteria. The new legislation will give police expanded powers to prevent people as young as 14 from associating with other young people. The Flemington Kensington Legal Centre has condemned the bill saying it will escalate police racial profiling of indigenous people and communities of colour.